A Hurricane Michael victim surveys what's left of her Panama City home, after Hurricane Michael struck on October 10, 2018. When Hurricane Michael struck Mexico Beach on October 10, 2018, it made history as the strongest storm to hit the mainland United States since Hurricane Camille in 1969. Just shy of Category Five strength, the storm cut a path of destruction through ten North Florida counties, killing at least 47 people before heading into Georgia. Florida's Office of Insurance Regulation recently reported that the insured losses from the storm have topped $5.8 billion. Recovery in the Panhandle and elsewhere is still ongoing. But disaster relief for the affected counties was not included in a spending bill recently approved by Congress. And that has many north Florida lawmakers angry. Congressman Neal Dunn, a Republican who represents a district covering the eastern part of the Florida Panhandle along with much of the Big Bend region, says he is "stunned" by the lack of disaster recovery funds; he voted against the spending bill in protest and is now working on a supplemental disaster relief proposal. 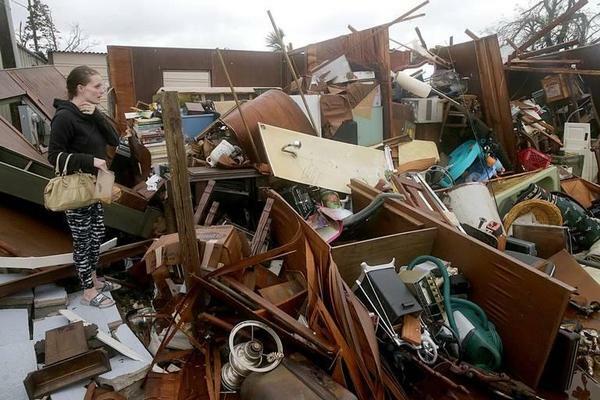 WLRN spoke with Dunn about the damage the storm inflicted on parts of north Florida, the amount of recovery funds needed and why he feels Hurricane Michael is fast becoming "the forgotten storm." WLRN's Christine DiMattei interviews Republican Congressman Neal Dunn about his efforts to secure more funds for Hurricane Michael relief. WLRN: Can you give us a sense of the kind of damage this storm did -- not only to individuals and families, but to whole industries in northwest Florida? DUNN: Thirty-seven percent of the economic activity in Bay County, which was the county it made landfall in, depended on Tyndall Air Force Base. And Tyndall Air Force Base went down 100 percent -- every mission closed, at least briefly. We've brought some of those missions back, but we cannot operate our F-22s out of there. And it was the world's largest F-22 base until the hurricane came along. The spending bill recently approved by Congress does include money for the Federal Emergency Management Agency, FEMA. How much does that help hurricane ravaged counties? It does help us. However, the scale of this disaster is so enormous that the FEMA money we have simply will not cover it. We have more debris than any storm has ever caused in the history of the country. And of course, all of the military repairs to our air force base, our navy base, even the Coast Guard base -- those are not covered under the normal appropriations bills or FEMA or HUD. It was recently decided that settlement money from the 2010 BP oil spill will be used to help four Northwest Florida counties with the anticipated property tax losses caused by Hurricane Michael. The payout would be about $15 million. Also Florida's tourism marketing arm, Visit Florida, is awarding about $860,000 to communities that sustained heavy damage. But, is that enough? No. It's a generous thing to do and it certainly helps these county governments remain open and serve their people. But that isn't even pennies on the dollar of the loss. Thirty percent of all the homes in my home county are uninhabitable. Almost a third of our police force remains homeless. The damage here has to be seen to be believed. Have you been working with lawmakers from other states? Yes. This disaster supplemental is not just about Hurricane Michael. It is also about every other disaster that happened in 2018, including (Hurricane) Florence, which wiped out Camp Lejeune (in North Carolina), and the California wildfires. Also, the Alaskan earthquake and the volcanoes in Hawaii.